As soon as one of the seven forces of organisation changes, it impacts on the others in a clockwise and counterclockwise manner, creating a dual flow of change in the system. A radical change in the environment or a desire of the system to reinvent itself necessitates a review of ethos. A change in ethos will induce according changes in the aims, process, structure, governance and substance (mei) of the system. This is referred to as clockwise change. Introducing change in a clockwise manner ensures coherence between the various forces of organisation. The clockwise change is therefore used for (re)designing a system. Within an existing system, there is always a potential for counterclockwise change, analogous to the kinetic energy of an object. Each force of organisation has momentum that perpetuates its current configuration into the future. 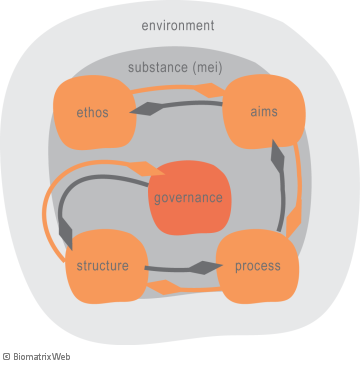 More specifically, current governance reinforces existing structure, which continues to channel current process to achieve current aims, reinforcing existing ethos. Likewise, current resources (mei) support current functioning. The momentum perpetuates and is not actually initiating a change per se. However, as it is challenged by the clockwise change, it is aroused to resist. The two types of change represent the two dominant directions in which the seven forces of system organisation interact. Change management creates awareness of the effect of the seven forces of organisation within the current system. It also involves stakeholders in the (re)design of the system in terms of the seven forces in a clockwise manner.